A while back my sister and I were out and about in downtown North St. Paul, which is basically right down the street from me. There are a couple of antique shops along the main street, as well as a couple of thrift shops so we were just meandering around doing a little window shopping. We were walking into the larger antique mall when I noticed this bookcase in the window. It was missing its shelves entirely, and one of the drawer pulls was broken. Overall, it was just in pretty shabby shape, and not shabby in a good way. But the price was right and I could see it had tons of potential. So I bought it, and Debbie and I loaded it into the back seat of my VW bug. Luckily it was a beautiful day and we were able to have the top down. Plus, we only had to drive a few blocks with it. Later I purchased a couple of inexpensive pine boards and Ken trimmed them down to create new shelves for it. And then it was just a matter of adding some paint and some new knobs. The lovely people at Fusion recently sent me a few more of their paint colors to try (plus a couple of favorites). So I pulled out two colors from their Tones for Tots line for the bookcase, Little Lamb and Little Piggy. I’ve used Little Piggy before (here, here, here and here). It’s the most delicate pale pink. I had never used Little Lamb, but I thought the two would make a great pairing. 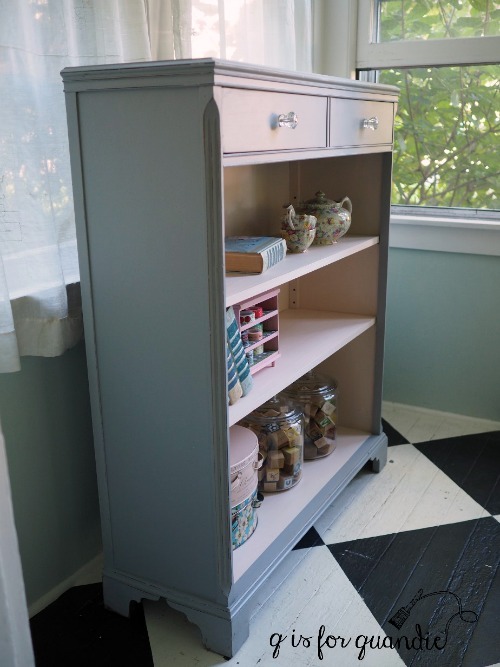 I added two coats of Little Lamb to the outside of the bookcase, and two coats of Little Piggy to the shelves and inside of the bookcase. Once dry I used some 220 grit sandpaper to distress the edges of the Little Lamb. 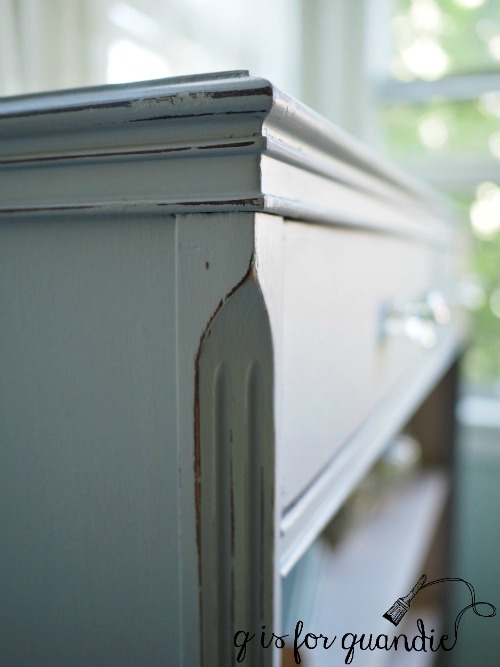 I know not everyone is a fan of distressed edges, but I think it serves to highlight the details like those pretty corners. This bookcase was a little bland until I added the distressing. Although my color choices make this bookcase perfect for a nursery, I didn’t really have any cute baby things to use while staging it for photos. So I just went with some random items in the right colors. And of course, you wouldn’t have to use this in a nursery. 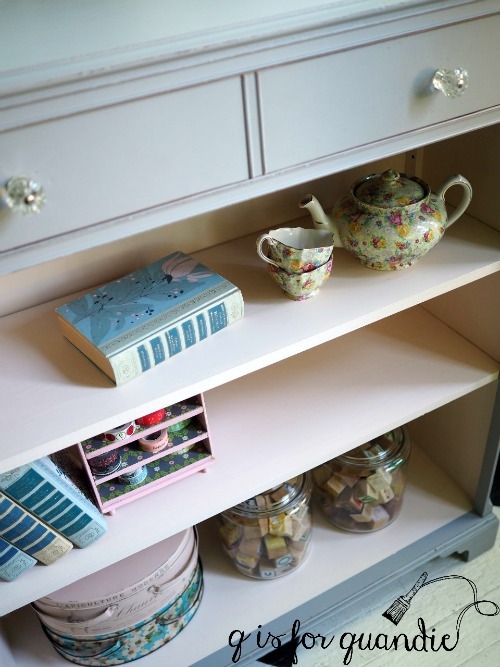 It could be used anywhere that you happen to need a pink and grey bookcase. I really struggled to capture the color of this piece. I feel like the Little Lamb looks too blue, or too lavender in most of my photos. Although in person it does have almost a periwinkle undertone to the grey. This is just one of those colors where you really have to see it in person. But truly, isn’t the difference between the ‘before’ and ‘after’ like night and day? What a difference a little paint can make. Be sure to check my ‘available for local sale’ page if interested. Previous the mystic midnight blue dresser. Wow…you are right…night and day. You gave that piece new life! Beautiful! Thanks Linda! I’m still amazed by what a little paint can do. 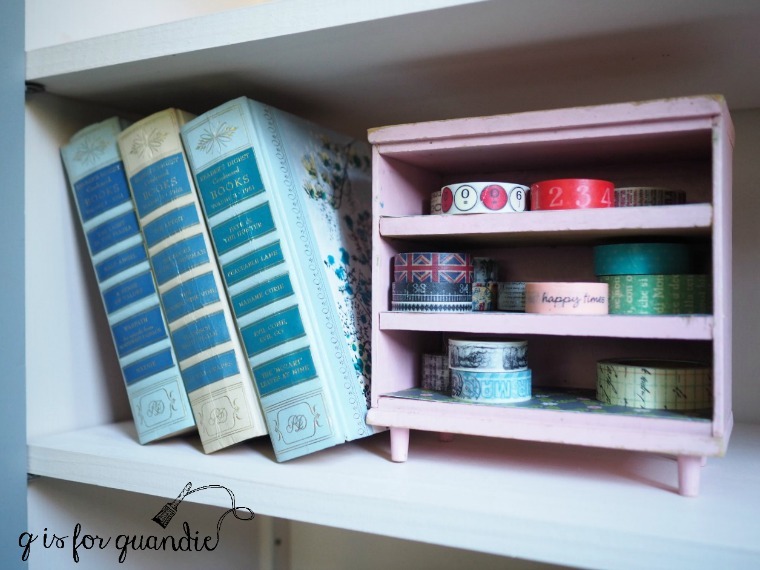 So much better…the paint really brings out the nice shape of the bookcase and the glass knobs look just perfect! 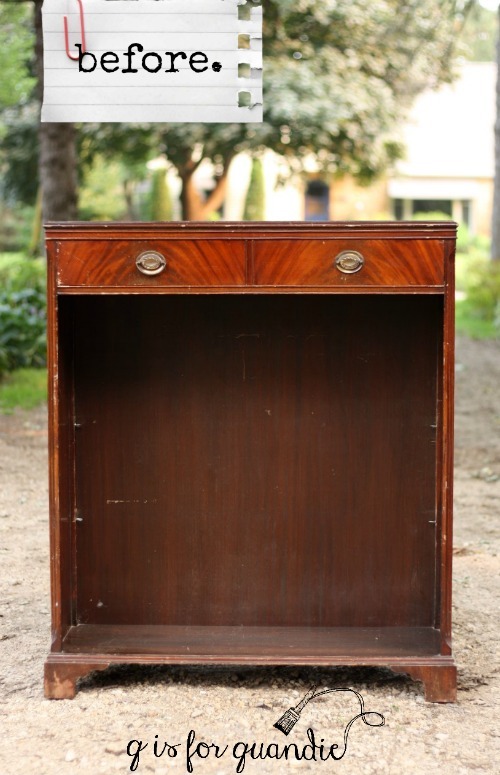 It would also look nice in a casual dining room with some pretty dishes stacked on it. Did you sand before applying the Fusion paint? I love that idea Bee. Would be perfect for some pretty floral dishes! I broke the rules and did not sand this piece. The finish was in pretty rough condition (meaning it already had some ‘tooth’ to grip the paint) so I just cleaned it with TSP substitute. Another example of the transformative power of paint! I agree that the details are so much more apparent now. Charming colors, too! Great transformation! Love the “softness” of these colors…and a gray and pink nursery would be sooo cute. Makes me wish for a “do-over” for my first baby’s nursery (1980), which was a really weird shade of green. Lol. Didn’t look weird on the sample…just on the wall…live and learn. Another good job by Quandie. I have to say, after seeing that first picture, I thought ,oh boy, this is a sorry piece of furniture! Why would she even buy that! Of course, as usual you saw something i didn’t. Ken did a great job with the shelves, not too thick. This really turned out well. Fusion is a smart company providing you with paint so you can show us your miracles! It convinced me and my husband to try it. Because of you, we have both used fusion and love it. My husband loved the self leveling of it and the coverage. We now have a fusion dealer in our antique mall!! Yea!! I’m glad I brought back some fun memories for you, but I have to admit I feel a little bit bad for Queen Esther. I don’t think I should like to be called Pig! I recently bought a large jar of Fusion’s Limestone after seeing some pieces you painted with that color. Today I painted a chair with the Fusion, and I have to say I love it. The Limestone color is the most perfect white for me, and the Fusion paint really beats a lot of the other brands. I know I probably sound like an ad for Fusion, but I really do love it. Funny thing is, I’ve bought a couple of jars of Fusion in the past, but never even opened them. Got to round those jars up now. I’m so glad you like the Fusion Limestone Sugar! It is my favorite of the whites. I like a warm white that you can bring into a room and not suddenly feel like all of your other pieces in the room are dingy. 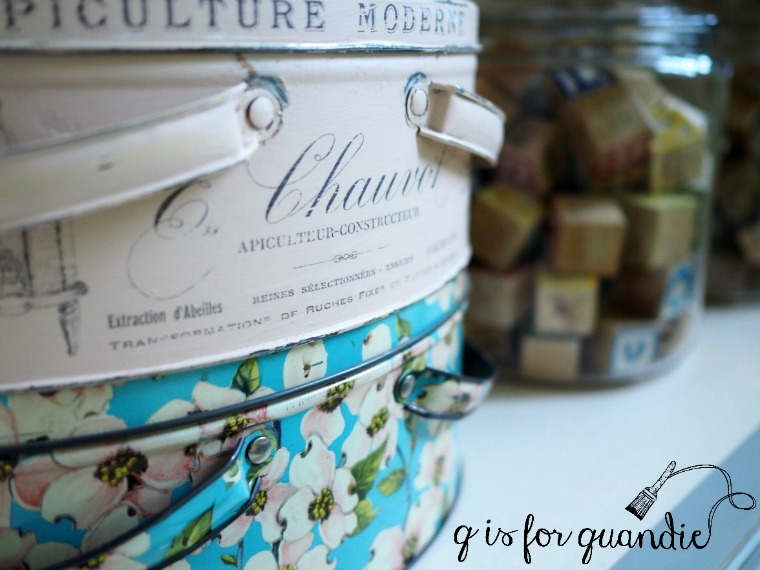 Go round up those other jars and get painting! I have just been waiting for one of my friends to have a baby girl. 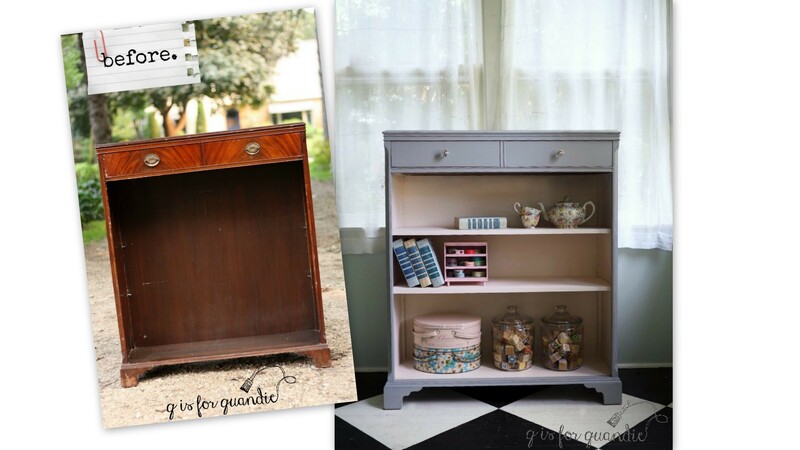 I would love to use the “little piggy,” on a small armoire for a little girls room. I love the color. I have never used Little Lamb. 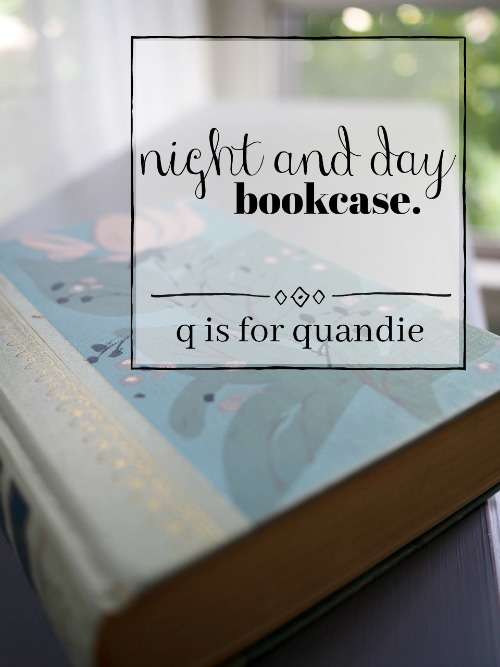 I love the combination on the bookcase. You amaze me with your vision for pieces and your talent. Thanks so much Monica! 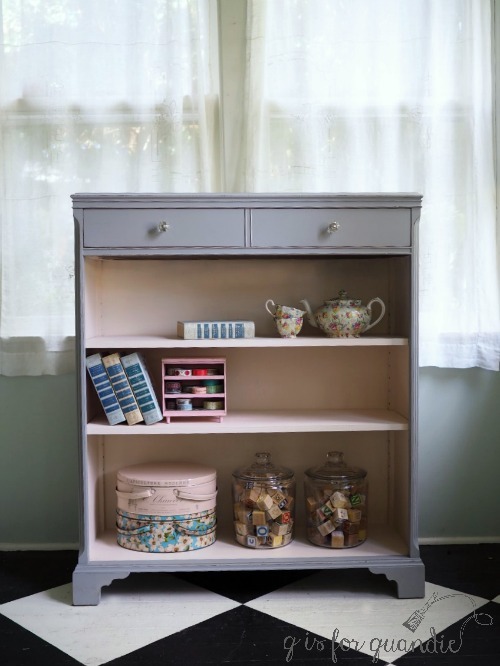 And a pink armoire would be so adorable! Maybe you just need to paint one to get it out of your system!